I love trying skincare products and especially products from brands I haven't yet tried, I do tend to play it safe sometimes with my skincare because my skin is so dry and I struggle to find products I love but I do also like to try new things, so it can be a double edged sword. Over the years I have become a bit of a skincare geek, especially after my skin becoming extremely dry and me researching and trying lots of products, so when I received some of the Time Bomb skincare products, I was very much looking forward to trying them and seeing how they worked for my skin. 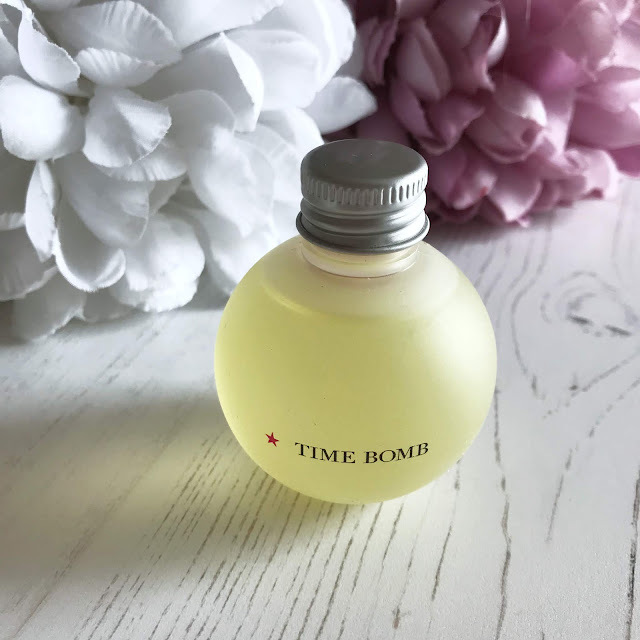 Time Bomb is a game-changer...and a clock-stopper.... in the skin care category. 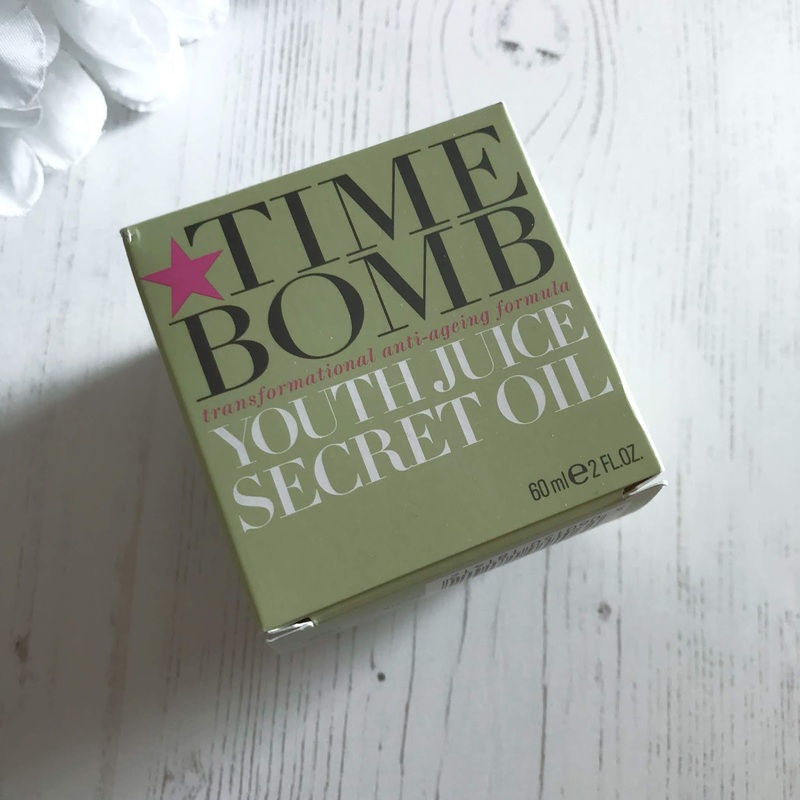 Having extremely dry skin, I was really looking forward to trying the Time Bomb Youth Juice Secret Oil, I like to use oils in my skincare routine, in the summer months as something I use last in my routine and leave to sink in overnight, and in winter, I use oils before my moisturiser and after my serum as my skin is extremely dry so I need the extra hydration during the day also. The secret oil contains a combination of oils including olive, kukui, avocado, sweet almond, sesame seed, lavender, coconut and jojoba oils that mimic the skins natural sebum as it can be lost with age. With a natural lipid compels, the ultra fine, non greasy blend not only quenches thirsty, ageing skin, but also creates a moisture barrier that helps to reduce the appearance of lines and wrinkles. The oil is rich in vitamins E and C, which helps to plump the skin and create an all over youthful glow. 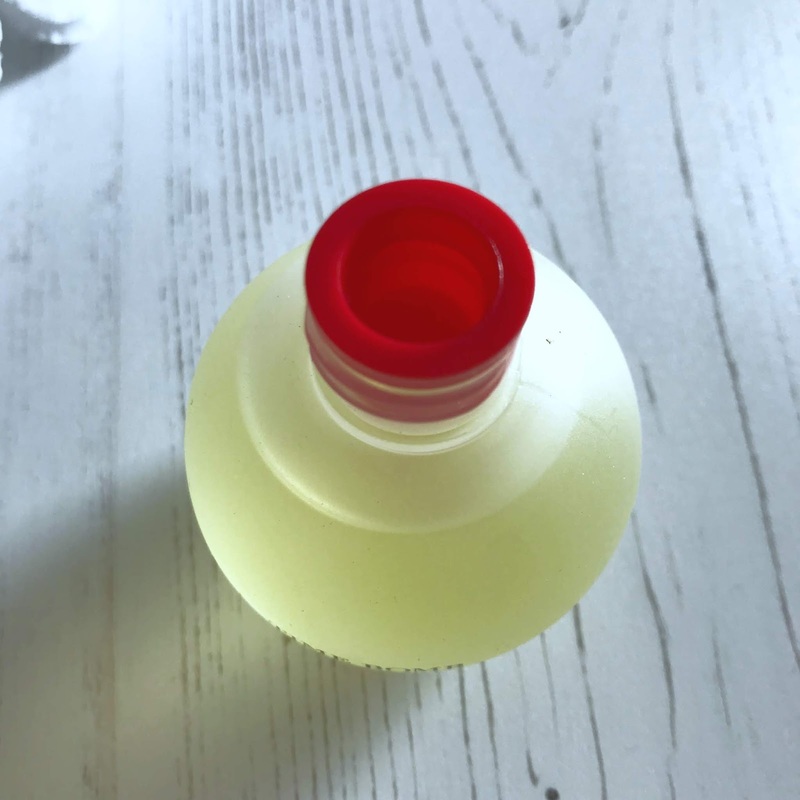 I really like the packaging of the secret oil, the lid screws off to reveal a red plastic stopper to stop the oil spilling out. I tried the oil out over the summer months so have used it most as the last step in my skincare routine at night, but have tried it several times after serum and before moisturiser. My skin feels lovely when I use the secret oil, it is so soft and plump and feels hydrated and smooth, if using the oil in a morning, my moisturiser applies well over the top and the oil doesn't take an age to sink in before I can apply my moisturiser, I only need to use a small amount and apply to my face and neck. When using the oil at night, I usually pop a little more on and leave it to sink in, my skin feels lovely in the morning and even after cleansing my skin still feels lovely and smooth. I have been really impressed with the secret oil, I can't say I have seen a dramatic difference in any lines I have but my skin looks soft, smooth and plump and feels absolutely lovely. 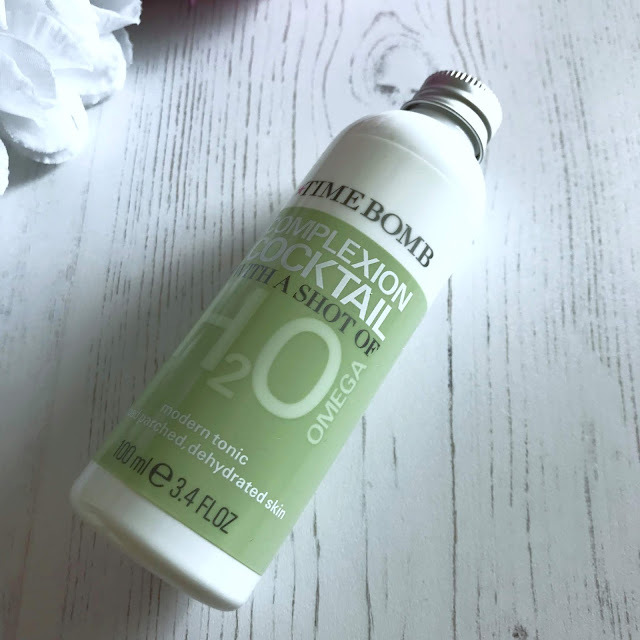 The Time Bomb Complexion Cocktail with a shot of H2Omega is a highly concentrated, proprietary Hyaluronic Acid Complex which acts as a moisture "magnet" attracting and retaining optimal moisture. It contains Chia Oil, natures richest source of Omega 3 EFA's and Electrolyte - Rich Coconut Oil, known for it's exceptional hydrating powers and is another source of Omega 3's. When I first saw the complexion cocktail, I was intrigued and couldn't wait to try it, to apply the cocktail you can either apply directly to the skin or apply to a cotton pad and then sweep all over the face and neck and can be used morning and evening. I have applied the complexion cocktail both with a cotton pad and directly onto my skin and I don't have a favourite way of using it, but feel I don't waste as much product if I put a few drops into the palm of my hand and then apply it to my face and neck. The bottle and a stopper in the lid with a hole in it (like a vinegar bottle has), so it doesn't pour out too much, it smells absolutely gorgeous and reminds me of holidays and pina coladas, it is lovely. It isn't as thin in consistency as water but also not as thick as a serum, it is somewhere in between, it isn't sticky and doesn't leave any tackiness to the skin, it sinks in well, leaving my skin ready for either serum or moisturiser. I apply the complexion cocktail to my skin after cleansing and using my acid toner, and depending on how dry my skin is either before or in place of my serum and before my moisturiser. In the summer months I used it in place of my serum but now I use it before my serum. Since using the complexion cocktail my skin is much more soft and supple and hydrated, I suffer with very dry and dehydrated skin and the complexion cocktail has made such a difference in how my skin looks and feels and I am so pleased to have had to opportunity to try it as it really is a fabulous product, I was pleasantly surprised at how long the 100ml bottle I have lasts too, it also comes in a 30ml £10.00 and 150ml £30.00 size too, I will 100% pick up the 150ml size when mine runs low. When the effects of fatigue, dehydration or pollutants wreck your complexion, reach for a cocktail! Each of these modern, skin-boosting tonics has a potent, concentrated shot to counteract your skin concern "du jour"
I think it's obvious I adore the Complexion Cocktail with H2Omega, so this set of three complexion cocktails got me very excited indeed. It contains the Complexion Cocktail with a shot of H2Omega, Complexion Cocktail with a shot of B12 and Complexion Cocktail with a shot of Chlorophyll, each bottle is 30ml making this an ideal set to travel with, or to try out all three which I have been doing, I already knew I loved the H2Omega and couldn't wait to try the other two cocktails too. The Complexion Cocktail with a shot of B12 is formulated with high levels of B12 and B3 plus Brown Algae, it jolts the skins own energy production into high gear. Formulated with Centella and Ginseng this potent concentrate improves micro-circulation for better skin tone and enlivened colour. A powerful blend of 12 Amino Acids and two types of Hyaluronic Acid replenishes skins surface layers and helps retain moisture for immediate visible plumping. This complexion cocktail is brilliant for my dull tired skin and also my dry and dehydrated skin, I have a lot of health problems and also don't get much if any sleep most nights, this is brilliant for perking up my tired, dull skin and also gives me the hydration I need. I apply it in the same way as the H2Omega cocktail and my skin is left looking bright and smooth and feeling lovely. The Complexion Cocktail with a shot of Chlorophyll is a detoxifying powerhouse, and gives the skin an instant reprieve from the onslaught of free radicals inside and out. Formulated to reduce the effects of toxins that contribute to premature ageing, this concentrated cocktail blends multiple, potent anti-oxidants known to target and neutralise different types of free radicals. Chlorophyll is a known scavenger of toxins and can help counter the effects of sun damage. Red Clover, a natural source of bio-anti-oxidants, helps to counteract the effects of environmental pollutants. A wheat based botanical extract, rich in peptides with anti-oxidant properties, targets internally generated free radicals. 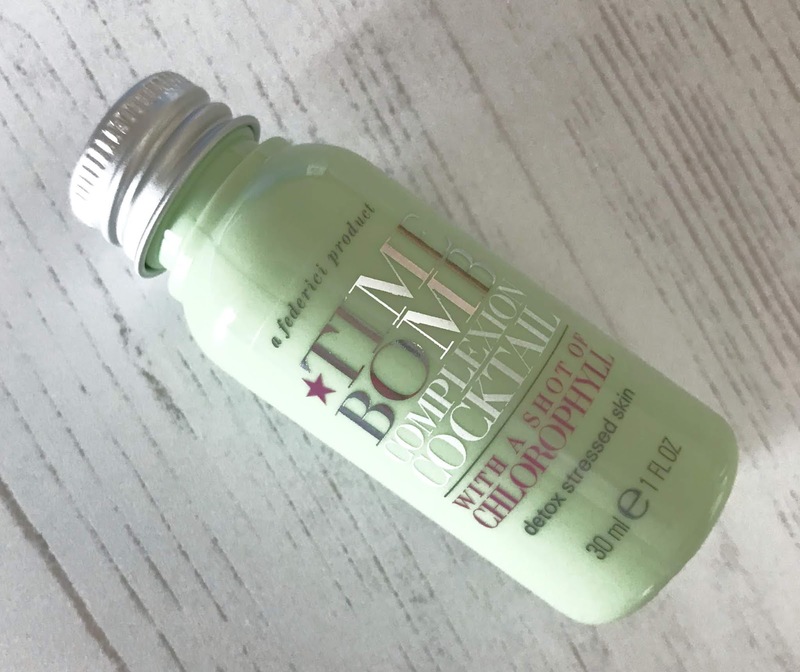 This complexion cocktail has a lovely fresh scent to it, applied in exactly the same way as the H2Omega shot cocktail, it leaves my skin feeling lovely and fresh after using it. I have very dry and dehydrated skin but I like to use this complexion cocktail if I have breakouts, I don't suffer too badly as my skin is so dry but when I do, this is what I reach for to add into my skincare routine. My daughter graduated in July and during the run up to her graduation she had quite a few breakouts, she always comes to me for skincare advice and I gave her some products to use, this being one of them and her breakouts cleared up and her skin looked amazing on graduation day. 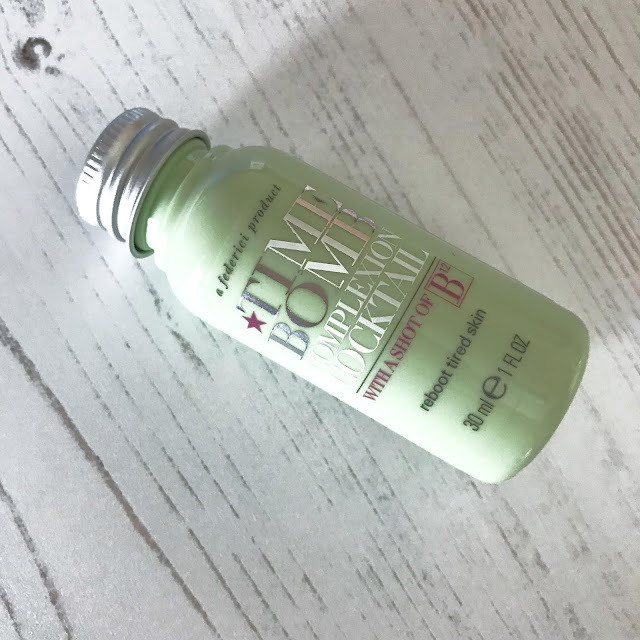 I am so impressed with all the products I have tried from Time Bomb, I think my favourite would have to be the Time Bomb Complexion Cocktail with a shot of H2Omega, it is a lovely product and has made such a difference to my skin, it looks so much better and feels smoother and softer, having extremely dry and dehydrated skin is the bane of my life and this is such a great product and one I love to use and will 100% be purchasing once the ones I have, have run down. I also love the Secret Oil, it doesn't leave my skin feeling greasy or tacky and my moisturiser applies beautifully over it it, the amount I need is so small and a little goes a long way, meaning the bottle will last me a good amount of time. All the Complexion Cocktails are brilliant and it's great to have the set of three as I can use each one depending on how my skin is, I do use the H2Omega shot the most due to me having such dry/dehydrated skin, but the B12 and Chlorophyll are also fantastic and my skin definitely looks and feels better for using them, the B12 is brilliant for my dull skin and the Chlorophyll for when I suffer with breakouts, it's a fabulous little set and one I highly recommend. I have been really impressed with both the Youth Juice Secret Oil and the Complexion Cocktails and I have been checking out the Time Bomb website to look at their other products and they have some great products some of which have definitely caught my eye. 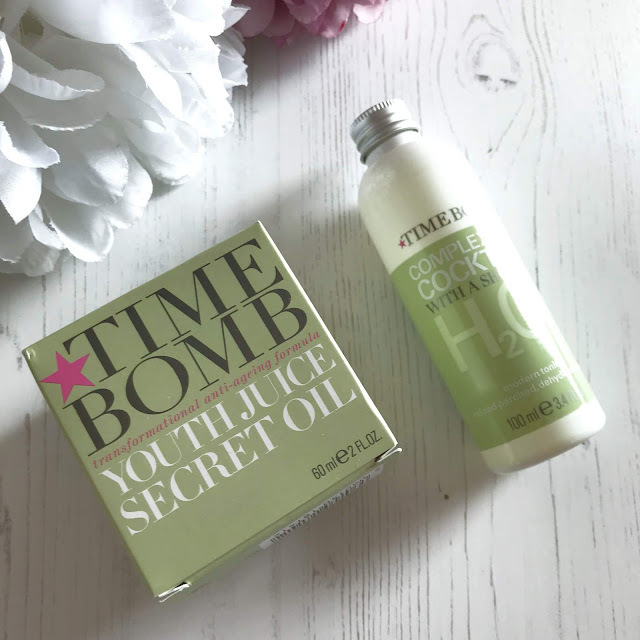 If you have yet to try Time Bomb, I can highly recommend the oil and the complexion cocktails, they are great products and have made a real difference to the way my skin looks and feels. If you would like to try the Complexion Cocktails Travel Set, you can find it here on the Time Bomb website, priced at £30.00 for a set of 3 x 30ml or if you would prefer to try just the H2Omega you can find that on the website here, sizes available are 30ml £10.00, 100ml £24.50 and 150ml £30.00. 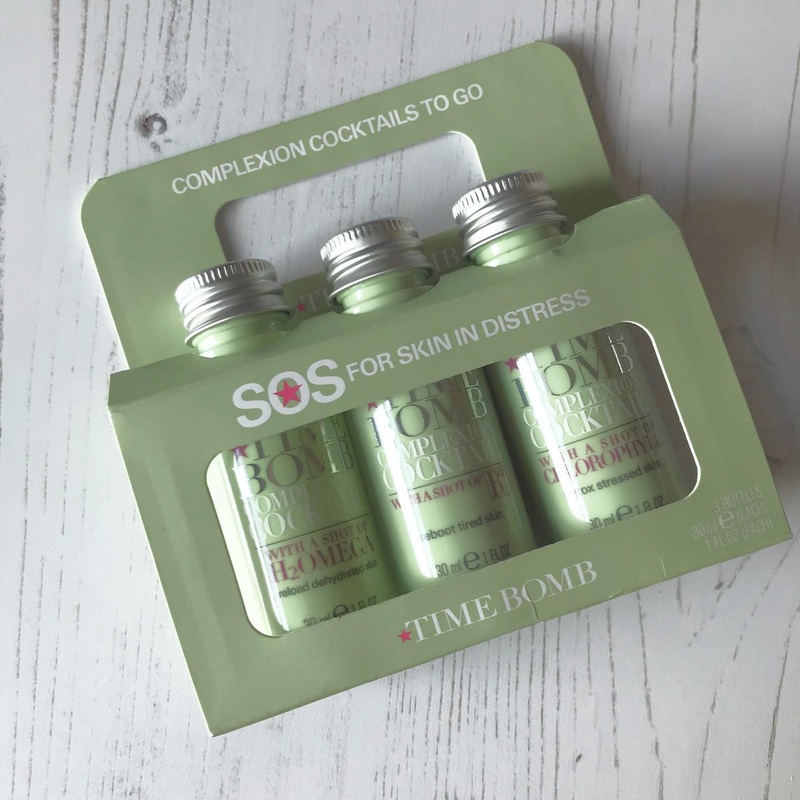 Have you tried Time Bomb skincare? or haircare? And if so, whats your favourite product?